Cambodia is more than just Angkor Wat and the Killing Fields. Yet, when most travelers plan their trips to Southeast Asia, Cambodia is either skipped completely or reduced to a sunrise over the five pine-cone-shaped spires of Angkor Wat and “A day of death,” the crass lingo multiple tourists have used to describe their itineraries that included visits to the notorious S-21 and Choeung Ek in Phnom Penh. As an avid surfer who rode the best waves in Bali, and a dedicated foodie who ate to his stomach’s content in neighboring Thailand and Vietnam, Cambodia, which lacks waves and gastronomy, was my favorite country in all of Southeast Asia. And it had little to do with Siem Reap or Phnom Penh. Kep is a small town in the Southeast corner of the country, where lush jungle borders the sea. While I’ve never been keen on the idea of driving a motorbike, and had convinced my wife that we did not want to look like the countless Westerners limping across Southeast Asia attired in full-body casts or wincing through road-chafed faces, the empty roads around Kep, which resembled scenes from a tropical retelling of “The Motorcycle Diaries,” and the location of a nearby killing cave that I wanted to visit for my book, Traveling the Cambodian Genocide, had us driving the beautiful countryside. Note: If you cross into Kep from Vietnam, the southernmost border crossing is without traffic. Though be skeptical of the transportation you arrange in Chau Dac. I had booked tickets to Kep that included a bus to the border and a transfer to an air-conditioned van. Our van turned out to be two motorbikes (which at least got me comfortable with the idea of renting bikes in Kep). Make sure to bring cash with you, since at the time of my visit, there were no ATMs in Kep and Cambodia does not accept or exchange Vietnamese currency, legally. One of the highlights of Cambodia is meeting the people. After years of living in a country plagued by genocide, civil war, and a corrupt, oppressive government, the Cambodians somehow find a way to be optimistic and lovely. Not only is hiring a tuk tuk for the day ridiculously affordable (and more romantic than a gondola ride in Venice or a crowded floating market in Thailand, if, that is, you escape the city), but drivers will often double as tour guides and provide a first-hand perspective on life before, during, or after the tragic ’70s. One of the best ways to access their personal histories is to invite the driver to lunch. (It only tacks on a dollar or two extra to your expenditures.) Each time we dined with our driver, they shared their incredible and often sad stories. When we visited Phnom Sampeau – where beautiful vistas from temple-topped mountains are proximal to three killing caves – one of our drivers, instead of lounging in his tuk tuk and catching up on sleep, spent the afternoon hiking with us, sharing with us the history of the place, and telling his personal story. There wasn’t enough time to finish his story atop Phnom Sampeau, so he invited us back to his house to meet his family and tell the rest. “Need to get off,” our driver announced after nearly creaming a suicidal dog. Two other bamboo trains had stopped ahead of us. Policy dictated that whichever side of the shared-track had less vehicles, those would be the ones to dismantle. I helped the driver break apart our bamboo train by tossing the pallet and the fifty-pound, barbell-like axles into the tall grass and then quickly reassembled to continue our death-defying ride. Note: There are other hazards besides potentially getting launched from the speeding train or sprouting a hernia from lifting the axles. My wife nearly lost her head, twice: once to a truck’s bumper that, at the last moment, reversed off the tracks, and again to a cow that had swung its rear in front of our path. Of course, you’re still going to visit Angkor Wat. That would be like traveling to Peru and avoiding Machu Picchu. (I’m guilty of that, but that’s another story.) While we did visit the temple complex by tuk tuk, as it’s the best way to arrive for the packed sunrise at Angkor Wat and the most efficient mode of travel for reaching the farthest, most intricate temple, Banteay Srei, renting a bicycle in Siem Reap was our best move. As many temples are crumbled heaps of rock or are so small that a quick drive-by would suffice, rolling up on bike and then quickly pedaling away made the most sense. If you’re looking for a beach scene that’s less rustic than Rabbit Island, check out the ones in the Southwest corner of Cambodia. Sihanoukville has nightlife and a sprawl of beachfront restaurants populated with tourists. If you want sand and solitude, head down to the laid-back Otres, a few miles past Sihanoukville. Great article. I believe nothing is better than seeing a country through the eyes of a local guide. They can tell you about experiences rather than just rattle off the facts and common known history. We had a fantastic guide in Cambodia who shared so much of his life with us. We felt privileged. Yes, Battambang is definitely a great place to go to get off the beaten path. Also, take a bike tour there or go on a kayak ride. No tourists for miles around! 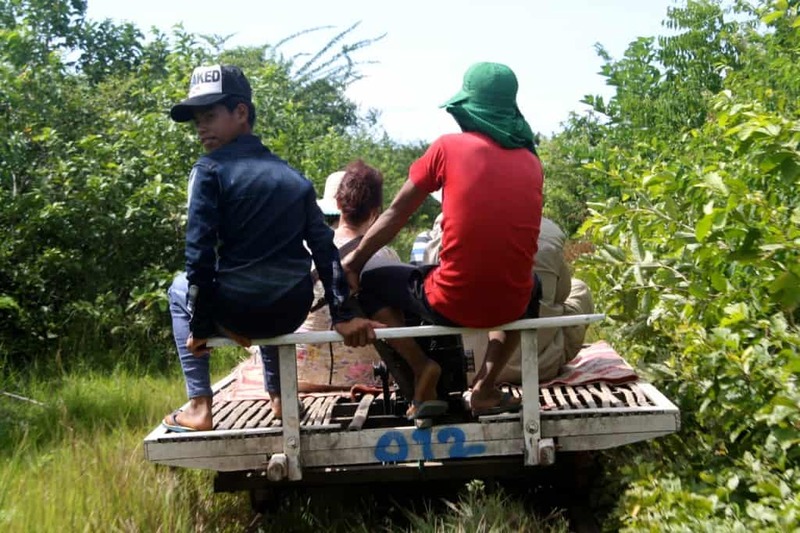 I liked Cambodia a lot and also had some interesting experiences getting to Battambang and our actual stay there was a interesting as we encountered what the locals called the gangsters. 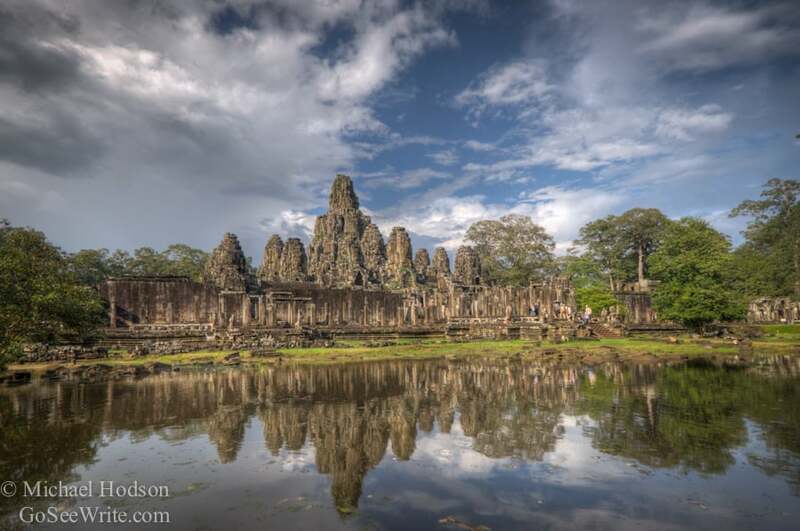 I thought that the food was exceptionally good and that the Bayon Temples in particular were spectacular. Phnom Penh itself I liked a lot – the people were very warm and very kind Great post. Great info, have actually made some notes ready for planning my trip to Cambodia! Ring in the train in Battambang, hitting the beach, renting bicycle and many more tips that you’ve shared are useful. Good work. Great post, very inspiring and informative. You got to start somewhere… Thanks! I love Phnom Penh. Gonna travel there this coming weekend! So excited. I left Cambodia into Vietnam yesterday. Agree wholeheartedly re tuktuk driver. I had him for 5 days, one of which was without the Tuktuk, just motorbike, to Phnom Kulen (in my opinion worth the 20USD, unlike general consensus). This doubled as a trip to find Sra Demrai which is a somewhat off-tourist-radar site; it was like it was our mission and adventure together for the day. Combined with good chats about commonalities and differences between our home countries, and local history. Very much missing that, especially after being ripped off by a Ho Chi Minh City motorbike driver since.